Five nights of coughing, and running on low sleep: this is the result I got. It was really, really late last night (9-6-09), and I was coughing my brains out. I couldn't sleep, and I was fed up with it! So, what did I do? I did what any artistic kid does when they are bored and can't sleep: I drew! And it was a lot to draw! 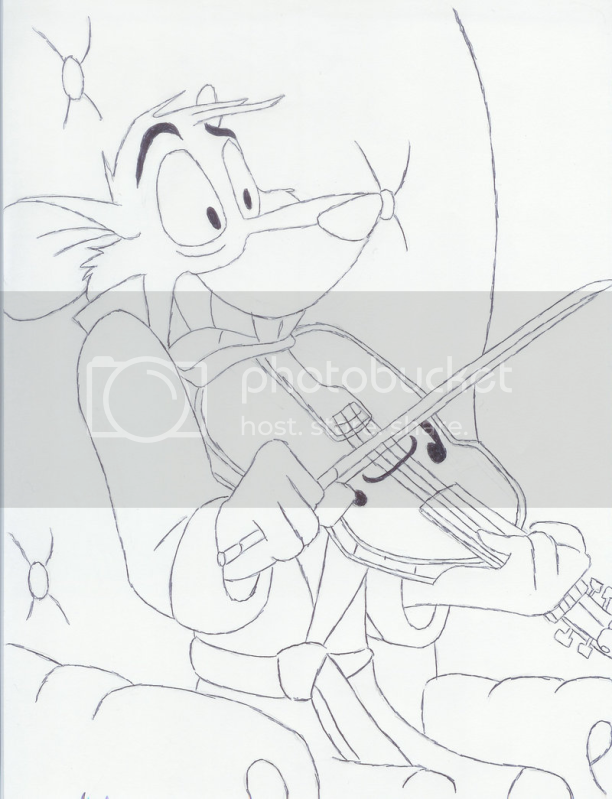 I'd always wanted to take a crack at drawing Basil when he screeches his bow across his violin. I love that part, and the look in his eyes makes me kinda happy in a way. Can't explain. Just wanted to try drawing it. Also, this is also for . I'm sorry I was so late, hun. HAPPY VERY VERY BELATED BIRTHDAY BRINA! I DIDN'T FORGET, I PROMISE! She's an awesome friend of mine. Lord knows she draws better than me, but that's okay. I absolutely promised her SOMETHING for her birthday, and I don't go back on my promises. I love you hun! I really like how this picture turned out, and I've become very attached to it. It's actually on very large paper (how I managed to fit it in the scanner, I'll probably never know), and other than being in the scanner, it stays in a hard, plastic cover that is COMPLETELY water-proof. It's very strong, and is almost impossible to break, unless you really want it to break. Oh! Also, Me + Violin = a trip through HELL! I had a HORRIBLE time trying to draw that d*mn thing! I tried though, and that's the most anyone can ask for. I hope I have this picture for a long, long time. Not much more I can say about it. Basil of Baker Street (c) Disney Studios, and Eve Titus.